You can’t go wrong with Berlie Doherty. She’s a highly accomplished author for Young Adults and never wastes a single word. The Company of Ghosts is no exception. Ellie’s running away from home, and receives a lucky break when she’s invited to stay on a remote Scottish island. Chance to clear her head and get some space. But then circumstances play a cruel trick and Ellie is left on the island – alone. Only perhaps not quite alone as she thinks… Who is the mysterious woman in the lighthouse, and will anyone help Ellie get home? 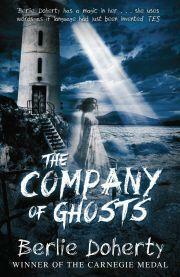 This is an atmospheric ghost story with a compelling and well-visualised setting. Ellie is a sympathetic character, and the resolution to her family troubles is ably handled. It’s a gentle ghost story but one that effectively lingers in the memory, and thoroughly enjoyable.